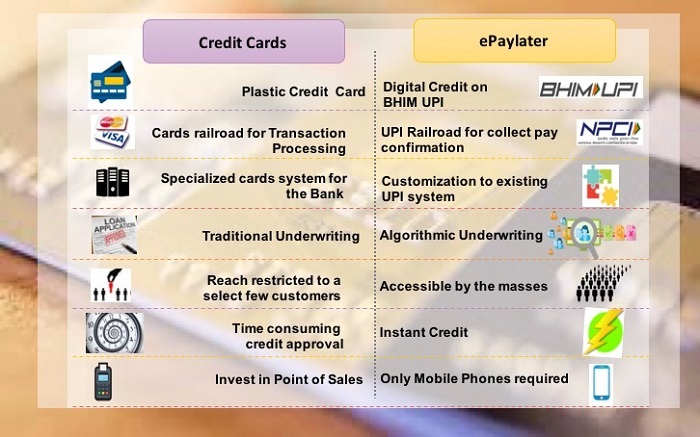 ePayLater, provider of innovative digital credit solutions, has partnered with IDFC Bank to bring instant digital credit to individuals transacting online and offline, using BHIM UPI. ePayLater’s ‘Buy Now, Pay Later’ credit facility works like a credit card without the hassles associated with a long application process or friction at payment checkout. For the first time, digital credit is made possible using the BHIM UPI railroad, the instant real-time payment system developed by National Payments Corporation of India facilitating inter-bank transactions. Individuals, merchants and small businesses can now opt for real-time credit, in addition to other prepaid modes of payment, for their purchases using BHIM UPI. ePayLater’s ‘Buy Now, Pay Later’ facility allows users to avail credit and transact, with a 14-day interest-free period from the date of purchase, to settle outstanding bills. This is the smoothest possible checkout experience, as users no longer have to pull out their card to complete a transaction. To gain access to the credit facility, users need to download the ePayLater application. It uses advanced machine learning techniques for a real-time credit assessment using data such as buying patterns, digital footprint, social media information, and device information. The user is then provided a credit limit in real-time, which can be used to pay for products and services at both online and offline stores. Here is how you can set up ‘Buy Now, Pay Later’. The app is now available on Google Playstore and will be released on Apple Store shortly. The process to understand how to create ePayLater UPI and use it to make payments is simple as well. ePayLater aids small businesses and merchants fast-track their growth forging radical partnerships with emerging FinTech companies using BAAP (Bank As A Platform). The procedure to avail either a line of credit, short terms loans, or merchant cash advance is simple and swift. With minimal paperwork, instant approvals and an effective buyer-payer management process in place that allows the settlement of multiple purchase orders online by receiving a payment link on the registered Email ID/mobile number, ePayLater has been harnessing their online platform to help scale small businesses and merchants. By deploying innovative technology and strategic alliances, ePayLater has been working towards extending its digital credit solution to a wider customer segment. The partnership with IDFC Bank provides ePayLater customised BHIM UPI solution that is required to offer instant credit. IDFC Bank’s association with ePayLater is in tandem with the bank’s strategy of forging radical partnerships with emerging FinTech companies using BAAP (Bank As A Platform). The Bank today has close to 24 partnerships for UPI payments and 4 partnerships for MSME digital lending. A focus on digital technology has resulted in increased convenience while transacting, improved speed and stability, paperless processes and additional security, leading to enhanced customer experience. It allows IDFC Bank to launch innovative products in a very short cycle time. ePayLater offers a “Buy Now, Pay Later” facility to users for purchases done through online and offline merchants. Through its offering the company provides users a greater, convenience, security, and ability to organize and pay for purchases in a more effective manner. With this innovation, ePayLater would bring Digital Credit in the hands of most consumers. It can completely change the way digital consumer credit is handled in India. (https://www.epaylater.in/). IDFC Bank (BSE: 539437, NSE: IDFCBANK) is a subsidiary of IDFC Ltd (BSE: 532659, NSE: IDFC). Headquartered in Mumbai, IDFC Bank is a universal bank, offering financial solutions through its nationwide branches, internet and mobile. Envisioned as a new age bank, IDFC Bank seeks to set a new standard in customer experience, using technology and a service-oriented approach, to make banking simple and accessible, anytime and from anywhere. In keeping with IDFC’s legacy of building the nation, IDFC Bank will focus on serving the rural underserved communities and the self-employed, while continuing to support the country’s infrastructure sector. IDFC Bank provides customized financial solutions to corporates, individuals, small and micro enterprises, entrepreneurs, financial institutions and the government. With best-in-class corporate governance, rigorous risk management, experienced management and a diversified team, IDFC Bank is uniquely positioned to meet the aspirations of its customers and stakeholders. www.idfcbank.com or Twitter, Facebook and LinkedIn.